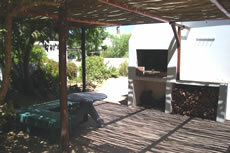 Accommodation in Darling: Maison Amnesia Self Catering Cottage. You are here: Home / Western Cape / Darling / Accommodation in Darling: Maison Amnesia Self Catering Cottage. 3 Star self catering cottage in the heart of old Darling.We are within easy walking distance to good shops,restaurants and theater(Evitas Perron ). There are 2 double bedrooms(1 en-suite).one 4 sleeper bedroomwith a sleeper couch in living are , full bathroom . The living at\rea is open plan with dine/kitchen and 8 persons can sleep over in very comfortable and quiet surroundings. The cottage is set in a quaint waterwise garden setting with an enormous braai area(wood supplied)leading to a sparkling pool. There is safe offroad parking for 2/3 vehicles. Darling is only 85km from Cape Townon a very good road(R27).